This month we're bringing you posts on the topic of breastfeeding education. Be sure to check out the links at the end for other great perspectives. I read countless books and websites when preparing to breastfeed. I didn't have the luxury of seeing more than a couple breastfeeding mothers firsthand, so I watched videos and pored over line drawings with arrows and notations. I used to visualize what it would be like and imagine holding my theoretical baby in place against my chest. I'd pantomime thrusting the head into position for the latch, and I would nudge my husband and show him what I'd learned. I'd go through all the steps with him, as if preparing him to nurse, but really just to reinforce what I had read and in hopes he could remind me if I did something wrong. My midwives had a little brown doll in their office that they treated with the same reverence they would accord a real baby, wrapping it carefully up again in its blanket after a demonstration. They showed me how to hold the doll with its tummy to mine, not in the bottle-feeding position of tummy-to-sky. I held the little plastic body against my chest to show that I understood. I felt a little silly, but not when I saw them swaddling the doll so lovingly. They believed in the importance of rehearsing this, and so did I. With all these new things to learn and explore, I found my mother's breastfeeding fascinating and a little ... well, I can't think of an appropriate word. Shameful? Titillating? (Does that smack of a terrible pun?) I wanted to stare but felt that this was private, that I really shouldn't look. I started feeding my own dolls up under my shirt, but only in private, so that no one would think I was gross. How do we learn breastfeeding? How are mothers educated? Most by classes and books, helpful professionals like lactation consultants, midwives and nurses, and then by the trial-by-fire of being tossed into feeding their own babies. All of a sudden, all the preparation is finished and there's a hungry newborn waiting to be fed, again and again -- and we do learn, but it starts out so foreign. The first time I was expected to bring my baby to my breast, I actually worried that the nurses hovering over this helpless baby might think I was some kind of pervert. I think that back when breastfeeding was the only way to feed babies that little kids and then parents must have learned to breastfeed the way people learn to wash themselves or eat solid food or put on clothes -- there is no overt education. The events just happen, so often and so naturally, that no one can help but see, and eventually do. It would have been natural and seamless and not a big deal in the least. And, so, I find my place in breastfeeding education, although I am not professionally trained or aggressively proselytizing or trying to do anything really other than feed my baby. It's just that every time I unhook my nursing bra and latch my baby on in a restaurant, in a house, on the bus, in the park, at a concert, on a boat, I feel like: I am breastfeeding education. I am showing a new generation how it's done. "I am breastfeeding education. I am showing a new generation how it's done." That's beautiful! I feel the same way. Although I've only just begun nursing in public, it has been an extremely easy transition that I worried about needlessly before giving birth. I am very proud to be nursing in public, unashamed, and promoting the best way of feeding my baby, hands down. Totally! I worried before, too, and wondered at how awkward I would find it. But it turns out it just feels good and right. Yea for you, and thanks for commenting! Oh, I just want to say, too, that the clothes on your site are adorable. Are you considering any boy clothes? I've been discouraged by the dearth of whimsical boy toddler clothes. Maybe I should get my own sew-happy mother busy! I'm sorry to say that we haven't had any luck with designs for boys as of yet. But we'd welcome any suggestions as you're not the first person to ask! What a great post! My brother is 4 years younger than I am, and my mom breastfed him for 3 years. I don't remember much of that, though. I agree with you that every time a mom feeds her baby when someone else is able to see, she is breastfeeding education. 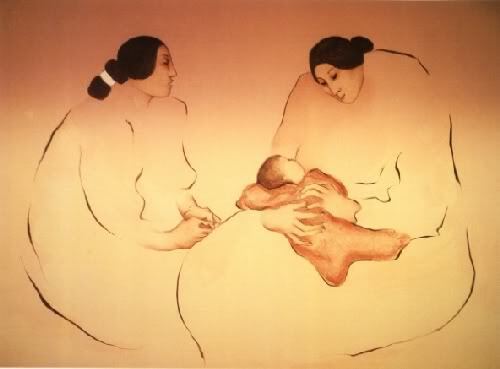 I am a youngest child, so it's interesting to me to hear how it feels to watch one's mother breastfeeding a younger sibling. How cool that you nursed your dolls! I actually wrote about that in my post for this carnival. I used to bottle feed my dolls, because they came with bottles and it never occurred to me to do otherwise. You are so right about us BEING breastfeeding education. Sometimes it is hard to sacrifice our, I don't know, comfort zone? I don't like getting dirty looks, but every look represents someone whose opinion is being challenged. If someone who generally respects me but thinks nursing in public is vulgar sees me nursing, perhaps they could be won over. Jenny -- That's a really cool perspective. I like the idea of gently persuading people who already think the rest of your life is cool, so they should really give this public-breastfeeding thing a second thought. It reminds me how it's important to stay pleasant and relaxed when nursing in public -- if I feel a dirty look, I sometimes start feeling defensive, but maybe they're just giving a curious look and I can just keep going and let them look their fill! Casey -- It's nice to know you have your mom's support at least! That's a cool story. My mom didn't breastfeed for very long, and she already thinks I'm weird for still nursing my 1-year-old. And, I know, what is up with the boy clothes? I was in a store the other day, and the girls section was all bright and shiny and all sorts of patterns, and the boy section was so drab -- blacks and dark colors, and every single shirt had a print that was either trucks or sports. Thank goodness for BabyLegs and such, so I can at least jazz up my son's outfits a bit! Hobo Mama, this is another great post that I can certainly relate to (just like Casey's!). Let's all stick together and keep on showing "a new generation how it's done." Maybe then our daughters and/or our sons' wives won't ever have to think twice about nursing their babies and what others might think. Also, many thanks for your support of my nursing at Mass article. I really appreciate it. I love your blog and am so glad I discovered your writing and another mom who's right here in the trenches with me. This is really the thing that my wife needs to know, I will make her read this post.